I’m starting a new project and want to share some pics as I go! These 4 chairs were filthy! I wouldn’t let my kids touch them until I cleaned them. They are also a little wobbly and I’ve got to get to the bottom of that. Each chair is different. I’m guessing that the previous owner refinished them all to make them appear like a set. The two Carvers Chairs in the center intrigue me the most, so I’m going to research their history. The first step in refinishing a project, is to give the wood a good wash. I used ammonia and water, and my rag was black from the dirt and paint that came off! Side note: DO NOT use ammonia on painted furniture for regular cleaning as it can take off the finish. 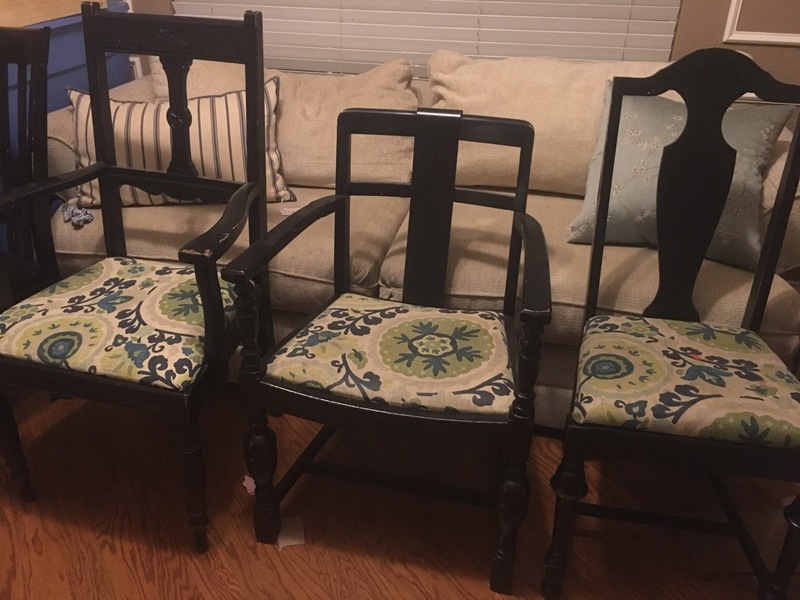 Since these chairs are getting new paint, I’m not worried about the current finish. Next I began removing the fabric from the chairs. I took the seats off and tightened all of the supporting screws. That helped with some of the wobbles. Next I began removing the fabric. I used a flat-head screwdriver and pliers to get the staples out. 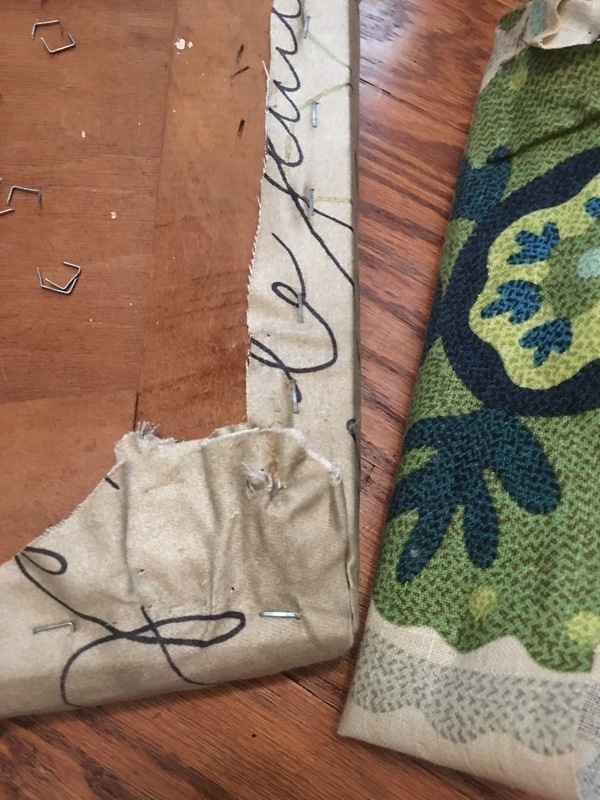 Underneath the first layer of fabric was another layer, and judging by the staples,I’m assuming the same person (maybe the last owner) recovered the chairs on two separate occasions. The first chair was simple, but things got messy when I got to the ornate Carvers chair. There were 5 layers of fabric on the seat! 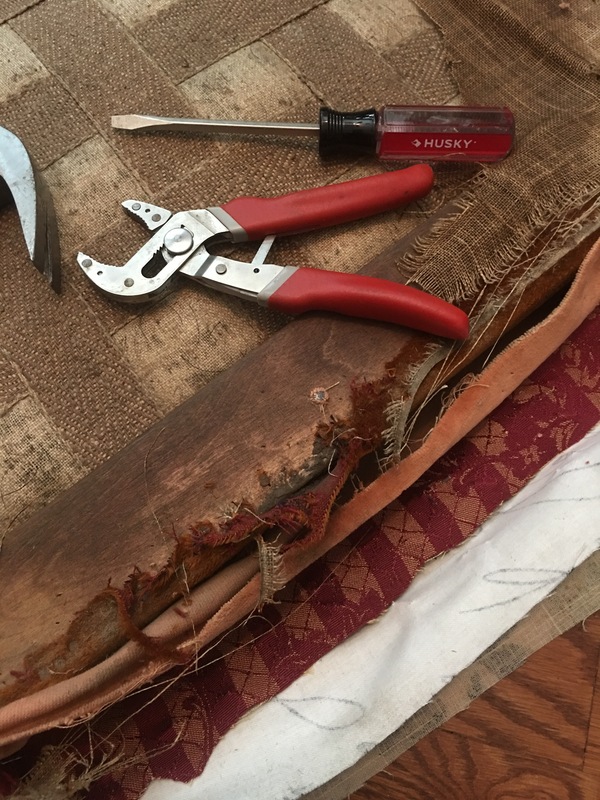 And the fabric and nails got older and older as I uncovered the layers! The last layer was disgusting, like haunted house disgusting! This curly black stuff that was used as padding looks like horse hair! I’ve never seen so much dirt trapped in between layers! 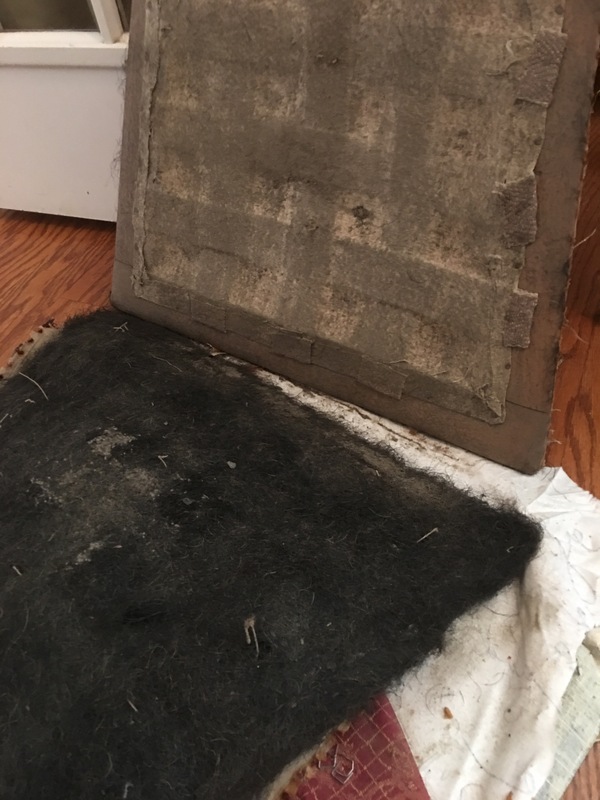 To think that through all the years people were just reupholstering over the top, layer by layer, and sitting on all that dirt! Ugh! This is how the carver chair looks now. 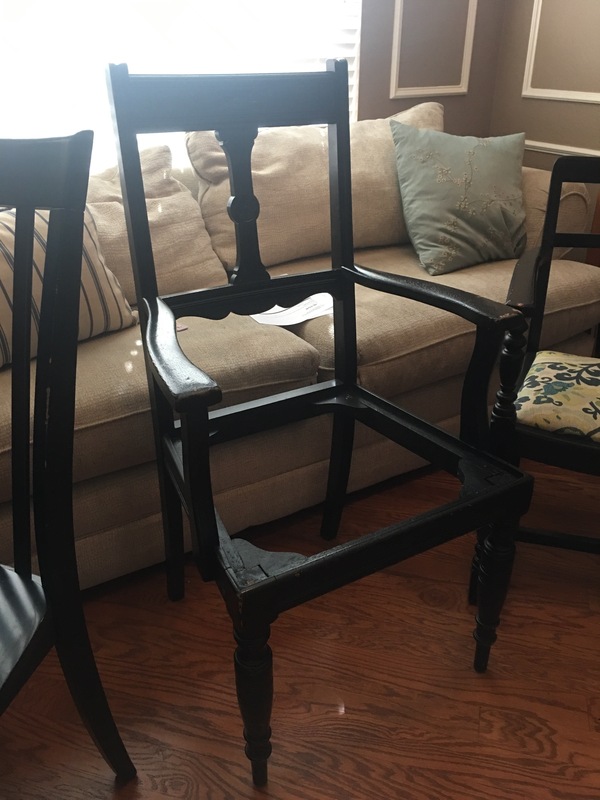 It’s by far the oldest of the 4 chairs. And I’m dying to know more about its history. 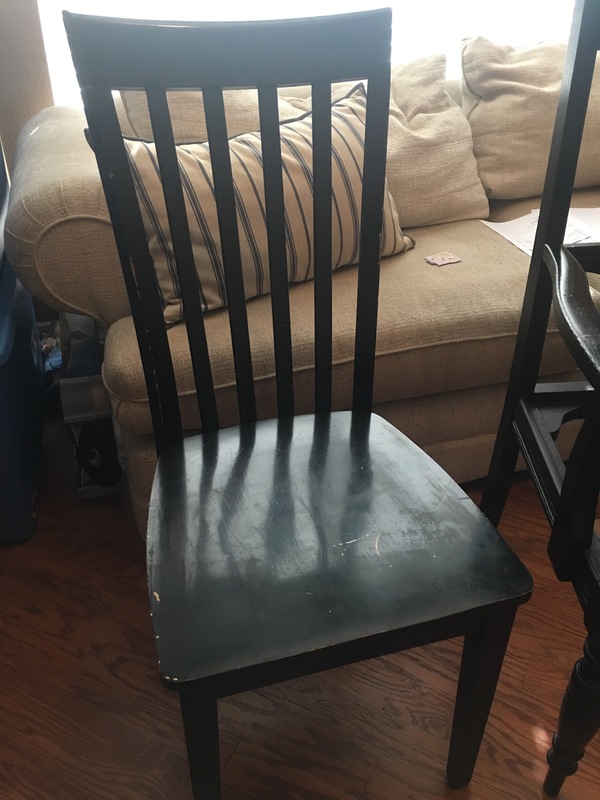 This basic dining chair is the heaviest and newest of the 4. 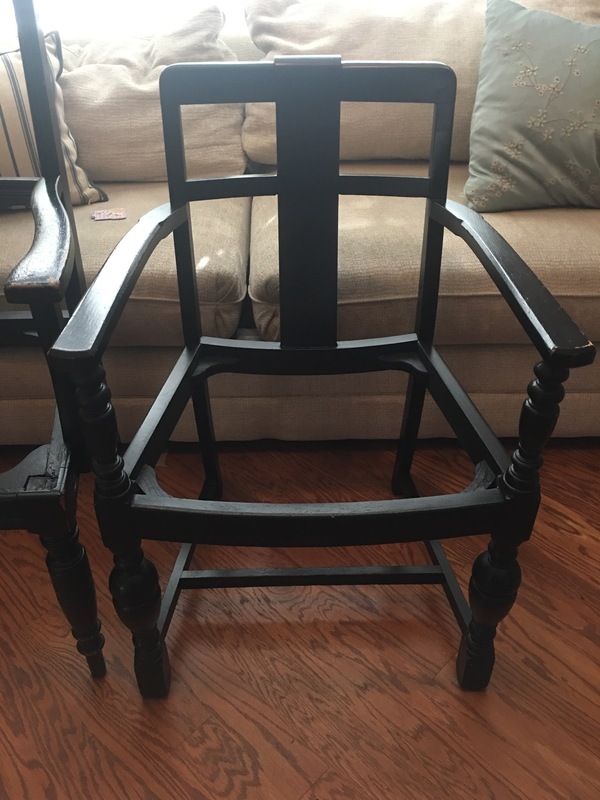 Another carver chair. I like the lower back on this one. 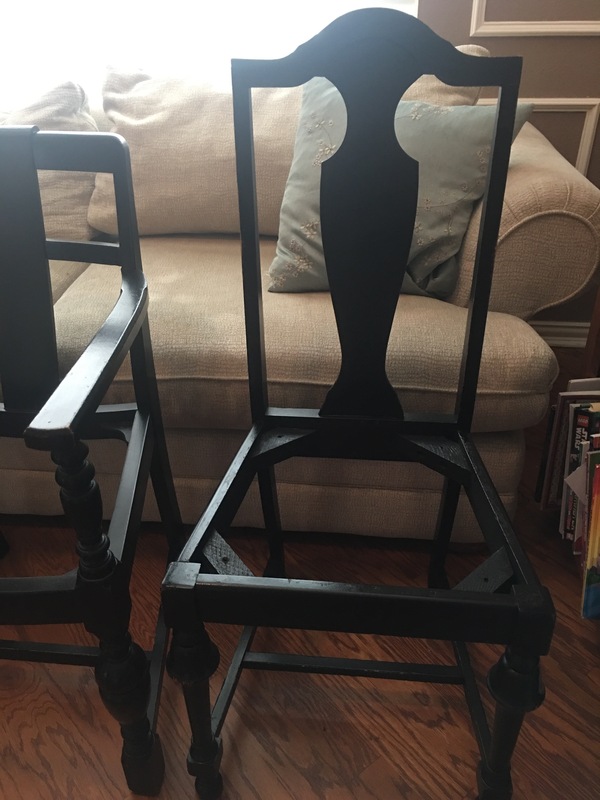 The 4th is a fiddle back chair that got attacked by some fingernail polish. Lots of junk on this one. Thanks for joining me behind the scenes today!! I just have to say, you really are inspiring! If I even would have picked them up I would have waited (for courage, maybe?) before I tackled that job. I love how you jumped right on it. Good job! Looks like you found some diamonds in the rough. Looking forward to seeing part 2.